Tomorrow is a holiday so I thought I would post something a bit different then I normally do. I’m always on the lookout for unique music and Sikhs, to share with you all. Many of you who have seen American movies that have scenes on Venice beach, and might already know about the guy named Harry Perry who to many of us is also known as Har Nar Singh. 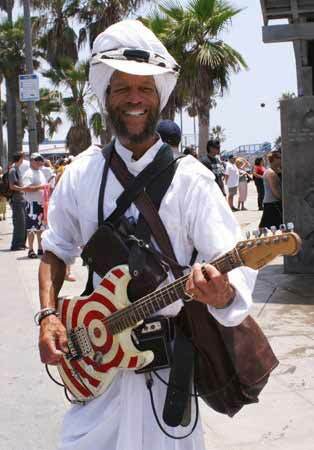 He is well known for riding on his roller skates up and down Venice beach playing music with his electric guitar. He is quite a character! I have known him since I was just a "wee lad" during the time when I lived in Los Angeles. My most distinct childhood memory with him is related to ice cream sandwiches which we used to eat at a health food store (both of which are not around anymore). I forget the name of them but he used to call me "Nectar Name" which was a spin off of the ice cream sandwich name. For some reason I always remember him saying that to me. In any case, he comes to Summer Solstice every year and always jams out somewhere singing his heavy metal music. Some of his music has all kinds of spiritual lyrics too, so it is quite interesting hearing it. He also plays some Gurbani (Herry Perry heavy metal style!) which most of you have probably never heard before! During Summer Solstice on the last day there is always an all night rensabai kirtan, where everyone sleeps under the huge shelter and listens to the kirtan all night (sleeping or awake). I always find it funny how Har Nar Singh (Harry Perry) always ends up with the early morning time slots when everyone is asleep. Why you ask do I amuse on this note? Normally at 2-3AM I would think about hearing some kirtan that is mellow and not too loud. Harry Parry literally rocks you awake from your sleep with his heavy metal version of "Raj Jog Takhat Deen Guru Ram Das". Maybe it is a hint to get up early for the morning Sadhana! Hahaha… I have long since given up trying to sleep during the all night kirtan and normally just sleep in my tent hearing the kirtan from afar as it travels around the campsite. Have a listen below to a recording of him playing "Raj Jog Takhat Deen Guru Ram Das" during the rensabai kirtan a couple of weeks ago and you’ll know what I mean. It rocks! Not that I’m a heavy metal fan…but it just makes me smile, and I like that. It’s just so unique. Excerpt from his website: "The Harry Perry band has shared the stage with some incredible bands such as Jane’s Addiction, Bob Segar, Ted Nugent, and the Stone Temple Pilots, and will continue to collaborate on tours to create exciting entertaining shows. Harry is also well known for his appearances in seval feature films including "White Men Can’t Jump" (Starring Woody Harrelson and Wesley Snipes), Point of No return" (Starring Bridget Fonda), and Dragnet (Co-starring Tom Hanks and Dan Akroyd). Harry’s Existence is still immortalized by well-known artists on murals, and he’s made musical appearances in the hit videos of acts like Janet Jackson, Jane’s Addition, The Monkees and the Gap Band. Recent TV appearances include CSI, The Carson Daily Show, The Teen Choice Awards, and UPN’s "One on One.". A twenty foot figurine of Harry Perry is still paraded at Disneyland California Adventure theme park on a regular basis. He also appears in Jane’s Addition’s DVD "The Gift" which is being re-released this year on Rhino Records. Harry is the guy who skates the Venish Beach California ocean front walk singing and playing the electric guitar. He’s made hundreds of national and international media appearances. 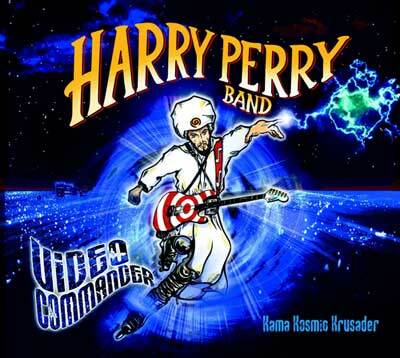 He’s formerly been the most recognized street player on the planet, and has now reinvented the Harry Perry Band with a new album release called Video Commander. " Heh. I like it! But..it is not heavy metal whatsoever. It sounds like a cross between psychedelia and perhaps a bit of punk, or maybe it’s just rock and roll. It’s certainly unique. I had my mat and bag up on the stage and drifted on and off into sleep during the all night rensabai. I remember waking up at three enchanting, intriguing blissful and beyond moments. One was to listen to Mr. Harry Perry. I was pulled from sleep smiling while listening to this raw sound in the intense hours of the late late night and early morning. Very strange and absolutely perfect at the same time…electric guitar, drum and soulful rock voice. The second was waking to the utterly sublime Lerraine as she sang Sweet Surrender in a voice direct from the heavens. Oh my god…the sound took me to a whole other place as I lay there with tears rolling down my face. If you have her time recorded Please post it…and last, but certainly not least was waking to bowing Jaap Sahib. I woke to hear the chanting and looking out and down from the stage to see this small sea of saints chanting and bowing, slapping their thighs and bowing and chanting. It was so very powerful. I thought…if I have been upon this path for no other reason than this, I am done now…this is all that was ever needed, there is no more. Such a magical night…completion. I always say it’s “not really Solstice yet” until you get to see Har Nar Singh walking around the site playing his unique way of worshiping! :-) He’s never without a smile and a kind word to say. Wahe Guru! Sadh Bakshish, I have a recording of the kirtan the whole night, but picked out the ones that I like and will be posting them soon. Do you know what time Lerraine played “Sweet Surrender”? I don’t know this song by the name…so if you have any hints that can tell me what this was so I can listen for it. First of all, this brings me back. This made my solstice experience by far! I had just finished packing up the bazaar and finishing my intensive solstice experience when the Guru called me to bow once before I went to bed. I bowed my head in sweet surrender and was met with a surprise. The door to the Guru was closing so they could prepare for the Amrit Ceremony. And, up comes the Harry Perry Experience to chant Guru Ram Das’ name. Now, as a person who adores hip hop and always intends on chanting God’s name through that media, I thoroughly enjoyed this unique form of devotion – though I was also confused as it was happening. It was both all over the place and yet contained. I kept on looking over at Guru Ganesha Singh and Dharam Singh who couldn’t stop laughing. It just kept on going. It was a mix of a crazy acid trip vibe (as Guruganesha said, it felt like it was during Woodstock) and a soul’s deep devotion of the Naad. There are many ways to chant God’s name – even rock’n’roll. I appreciate that he did it fully, stayed present, and made me laugh harder than ever. This was truly the exclamation to my entire 2007 Summer Solstice Sadhana. I’d have to say, “Just another day at the solstice site.” I am so glad that this was recorded. I truly can’t put this into words….Guru Ram Das coming through! There is an fantastic feel good factor bit two thirds of the way into the film when there is a dance in a park and stage area. Personally, I found the music insulting to my senses and my meditative space. This is not what I call Divine bliss, rather the opposite. The music seems to work on Santa Monica Beach where people tend to be stoned and thick headed. Sorry Har Nar Singh, it is just to much volume and screech and takes me down out of my elevation. I totally agree with Sat Kirin Kaur Khalsa. I have been to venice beach regularly and I have seen other people who are stoned and smoke all sorts of things. And seen Har Nar singh there everytime , on roller blades and playing electric guitar. No doubt, that he might the best person, but the music is just a noise. Kinda weird you let him play at the event. I was at Venice Beach earlier today and was honored to have Sardar ji Harry Perry perform the shabad Raj Jog Takht Deen Guru Ram Das. I enjoyed the fact that when he asked me if I wanted to hear a shabad or one of his rock songs, he played the shabad and everyone, tourists and otherwise, gathered around. Lol, because I was his original audience, everyone asked me what he was singing and I told him that he was singing a Sikh shabad, which was a catalyst in helping educate the average person about the faith. Although his style isn’t conventional in historical Sikhi (there was no harmonium during the Gurus’ time, yet we still use them today! ), he is definitely introducing to the world (Venice is like a hotspot of Kalyug!) the Sikh faith. Good stuff (I got a shirt from him too, haha). The guy is a legend…and we should all honor him for his philosophy of being outgoing and having a positive outlook on life. Didnt he perform on stage with the heavy metal/socially conscious metal band system of a down at ozzfest? 112831197052242986 - Arjan watching me and Narayan relaxing on the ground in the tipi.